May Thyroid disease trigger your depression? When someone develops depression, the brain usually becomes the focus of attention. However, other organs can be the source of the problem as well. A common example is when the thyroid gland produces too little hormone — a condition known as hypothyroidism. Although researchers are not entirely sure why there is a link between hypothyroidism and depression, it is likely that some people are taking antidepressants when they should really be taking thyroid medication. Although hypothyroidism and depression are distinct diseases, they are interconnected in many people's lives. Sometimes depression is the first indication that a person's thyroid is underactive (hypothyroid). If your doctor has diagnosed you with hypothyroidism, this means that your thyroid (a butterfly-shaped gland in the lower part of the neck) is secreting insufficient amounts of thyroid hormone, which, in turn, could interfere with the functioning of virtually every organ, tissue, and cell in the body. However, because of an overlap of some symptoms of hypothyroidism and depression, doctors and patients may overlook the possibility that a depressed patient could actually have an underactive thyroid as well. In those cases, the person's depressive symptoms could be caused by hypothyroidism itself. If you have hypothyroidism, you may have symptoms of fatigue, lethargy, difficulty concentrating, and excessive sleepiness that may lead to feelings of depression and the extreme sadness and despair that can accompany it. At the same time, you could have other symptoms commonly associated with an underactive thyroid, mentioned below. So what is thorough testing? In Depression & Your Thyroid, Gary S. Ross, M.D. lays out a systematic guide for testing and diagnosis. The first step is to figure out if you have any of the symptoms of low thyroid and to discuss this with your doctor. These are some of the signs of thyroid dysfunction, while you may experience only a few of these. Next, your doctor should conduct a physical examination, which will include checking your blood pressure, pulse, reflexes and thyroid gland. In people with low thyroid, blood pressure and pulse are low and reflexes are sluggish. Ross notes that during your physical exam, your thyroid gland tends to be normal. Because people with low thyroid typically get cold easily and have a low temperature, Ross suggests keeping a record of your temperature every morning for five days. Keep a thermometer by your bed and check it before getting up or moving. The first round of tests should include: Free T3; free T4; TSH (thyroid-stimulating hormone); antiperoxidase antibody and antithyroglobulin antibody. The second round of tests includes a 24-hour urine sample for T3 and T4 hormones. Sometimes the tests will include a TBII or thyroid-binding inhibitory immunoglobulin, but it is not typically ordered. Doctors usually perform the third round of tests to confirm positively that a person has hypothyroidism. They may look at adrenal function, male and female hormones, virus and bacterial infections, intestinal parasites, molds, food sensitivities, minerals, toxic metals, liver, coagulation, antioxidants, amino acids and organic acids. Whether you have any of these tests will depend on your symptoms and the previous tests. No blood test can completely and accurately reveal how much of the thyroid hormones is actually reaching the cells, entering the cells, and successfully turning on energy-producing biochemistry of the cells. This is why it is vital to develop an awareness of the subtleties of your physical, mental and emotional symptoms. Then, you put your whole picture together with all of the information gleaned from your tests to determine whether a clinical trial of thyroid medication is warranted. I hear from many thyroid patients who say, “My thyroid tests were ‘normal’ but I still think I have a thyroid problem.” And, my first question is, what was normal according to your doctor? As a thyroid patient who wants to feel well, you’re going to have to accept — and I know this can be frustrating– that you will have to become more knowledgeable, assertive and empowered when it comes to your health. And one of the most important steps is no longer relying on the phone call from the doctor’s office saying “Your thyroid tests came back normal.” Or the “Blood Test Results Summary” form letter in the mail that has “Thyroid, Urinalysis, Cholesterol, etc.” with little check marks indicating “OK” next to them. You need to know the actual numbers — actually, you need to have a hard copy of the actual lab results, and keep a file of them* — and you need to know what those numbers mean. Many people are not aware that for 10 years, physicians have not even been able to agree as to what is considered “normal” for the thyroid stimulating hormone – TSH – test. And beyond that, there are other issues, including normal TSH but abnormal T4/T3 — these are the actual thyroid hormones in the bloodstream — or normal TSH/T4/T3 but elevated antibodies — that can diagnose thyroid conditions. Hypothyroidism often develops because of some underlying disease or because a medical treatment impairs thyroid function. The most common cause of hypothyroidism is Hashimoto's thyroiditis, a chronic autoimmune disorder in which white blood cells make antibodies that attack and gradually disable the thyroid gland. Another autoimmune condition, atrophic thyroiditis, shrinks the thyroid. Either of these conditions significantly reduces thyroid hormone production. Partial or complete removal of the thyroid gland — whether for the treatment of thyroid cancer, an overactive thyroid (hyperthyroidism, the opposite of hypothyroidism), or some other problem — permanently decreases or eliminates thyroid hormone production, depending on how much of the gland is removed. Another treatment for an overactive thyroid, radioactive iodine, may disable the gland, causing permanent hypothyroidism. Likewise, radiation treatment for Hodgkin's disease, lymphoma, or cancers of the head and neck may have the same effect. * Damage to the pituitary gland. A tumor, radiation, or surgery may damage the pituitary gland, thus impairing its ability to produce and release TSH. Without this chemical signal, hormone production in the thyroid may fall. Some medications — including the mood stabilizer lithium — can suppress thyroid hormone production. 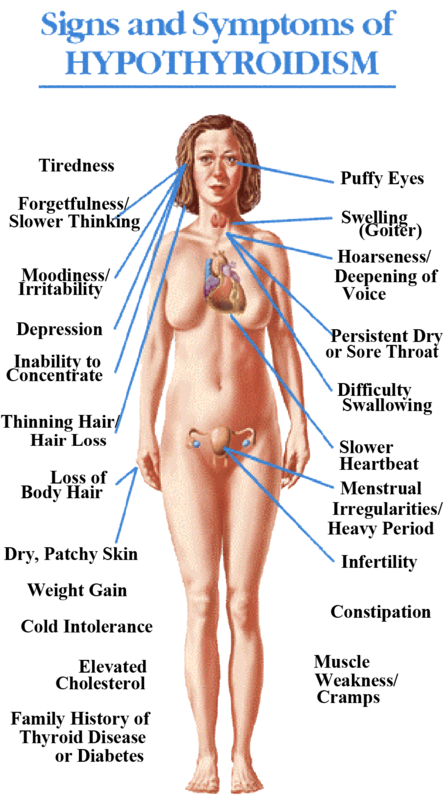 An infection, pregnancy, or other conditions may cause a temporary inflammation of the thyroid gland (thyroiditis). 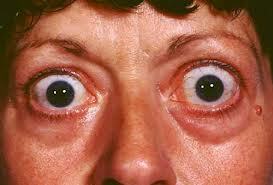 This may trigger a brief period of hyperthyroidism, followed by hypothyroidism. 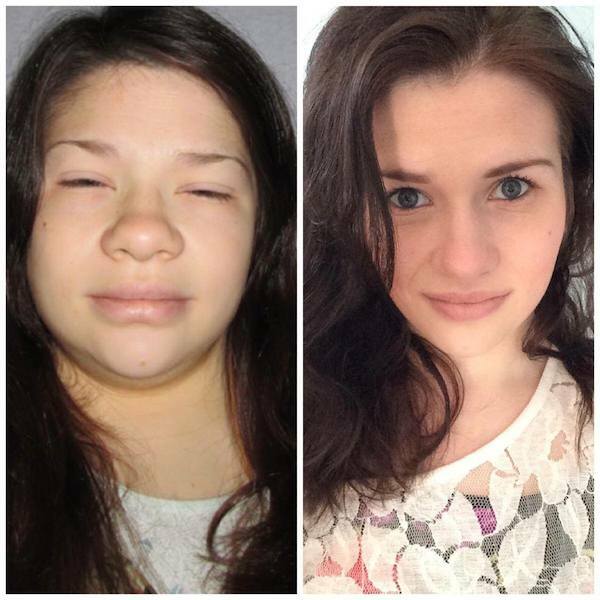 In some cases, the thyroid never fully recovers and hypothyroidism becomes permanent. Treatment usually involves taking a medication once a day to restore thyroid hormone levels to normal. Several options exist. The most commonly prescribed drug is a purified form of synthetic T4, levothyroxine (Levothroid, Synthroid, others). Levothyroxine works in the same way natural thyroid hormone does, provides stable levels of hormone, and is well absorbed. All brands are equally effective, but each brand or generic formulation contains slight variations of ingredients that may affect the amount of drug in the blood. The issue is not one of quality, because generic drugs undergo the same potency tests that brand-name drugs do. Instead, the problem is that pharmacies may substitute one generic for another. Therefore it is important to consult with your doctor if, for any reason, you receive a new brand. Clinicians determine the initial dose of levothyroxine based on a patient's weight, age, severity of hypothyroidism, and other medical conditions or medications. In older people, for example, raising thyroid hormone levels too quickly may place stress on the heart — so clinicians usually begin with a low dose and increase it gradually. All people metabolize drugs in different ways, making the same dose more effective in one person than another. Certain medications — such as the mood stabilizer carbamazepine (Tegretol) and the antidepressant sertraline (Zoloft) — may reduce the effectiveness of levothyroxine. Given all these factors, clinicians order periodic blood tests to monitor how effective a thyroid medication is for each individual, and make adjustments based on the results. Liothyronine (Cytomel), a synthetic version of T3, is eliminated from the system faster than T4, so levels fluctuate more. Another option is liotrix (Thyrolar), which combines both T3 and T4 in one pill. Both of these drugs may require more careful dosing to avoid raising thyroid hormone levels too far. Yet some people respond better to these medications. Thyroid medications are sometimes added to antidepressant treatment to improve mood — even when thyroid function is normal. Clinicians usually recommend liothyronine (T3 hormone) to augment antidepressant therapy, but in some cases they recommend levothyroxine (T4). One theory is that thyroid drugs act in concert with antidepressants in the brain. Another idea is that thyroid pills boost chemical activity in the brain, improving mood and concentration. The Sequenced Treatment Alternatives to Relieve Depression (STAR*D) study evaluated the combination of T3 thyroid hormone and antidepressants in people who had not improved after two previous treatments. About 25% of those taking T3 thyroid hormone saw additional improvement in their symptoms. Making dietary changes is your first line of defense in treating hypothyroidism. Many people with hypothyroidism experience crippling fatigue and brain fog, which prompts reaching for non-nutritional forms of energy like sugar and caffeine. 3. Get fat. Fat is your friend and cholesterol is the precursor to hormonal pathways; if you are getting insufficient fat and cholesterol, you could be exacerbating hormonal imbalance, which includes thyroid hormones. Natural, healthful fats include olive oil; ghee; avocados; flax seeds; fish; nuts and nut butters; hormone- and antibiotic-free full fat cheese, yogurt, and cottage cheese (yes, full fat, not skim); and coconut milk products. 5. Go 100% gluten-free. The molecular composition of thyroid tissue is almost identical to that of gluten. Eating gluten can increase the autoimmune attack on your thyroid. 6. Be mindful of goitrogens, which are foods that can interfere with thyroid function. Goitrogens include broccoli, Brussels sprouts, cabbage, cauliflower, kale, kohlrabi, rutabaga, turnips, millet, spinach, strawberries, peaches, watercress, peanuts, radishes, and soybeans. Does it mean that you can never eat these foods? No, because cooking inactivates goitrogenic compounds and eating radishes and watercress in moderation is not going to be a deal-breaker. 7. Go for the glutathione. Glutathione is a powerful antioxidant that strengthens the immune system. It can boost your body’s ability to modulate and regulate the immune system, dampen autoimmune flare-ups, and protect and heal thyroid tissue. 8. Do a gut check. A whopping 20 percent of thyroid function depends on a sufficient supply of healthy gut bacteria, so it is best to supplement with probiotics (friendly intestinal bacteria). 9. Address silent inflammation with whole foods nutrition. Systemic inflammation and autoimmunity often go hand-in-hand. 10. Address adrenal fatigue. There is an intimate connection between your thyroid and adrenal glands and it is uncommon to have hypothyroidism without some level of adrenal fatigue. The thyroid and adrenals are like Frick and Frack – so tightly in cahoots that it is not effective to address one without the other. 11. Look at your stressors and practice relaxation. The thyroid is a very sensitive gland and is exceptionally reactive to the stress response. 12. Ask for the thyroid collar. The thyroid is sensitive to radiation, so next time you are getting an x-ray at the dentist, ask for the thyroid collar.